It’s always there and it’s often overlooked, but the menu bar is a very useful part of the Mac operating system. The menu bar at the top of the screen has been with the Mac since the beginning. It’s one of the defining characteristics of the Mac, one that even Microsoft didn’t dare duplicate—in Windows, the menu bars go on the top of windows, not at the top of the screen. The Mac menu bar is a constant, a north star. Apple also recently added a new “Use dark menu bar and Dock” mode, which flips the normally black-on-white menu bar into a design only Darth Vader could love: white text on a black background. It’s not my cup of tea, and flipping that setting doesn’t change the style of any of the other black-on-white windows on my Mac’s screen, but if you like it, more power to you. Even as someone who has committed plenty of keyboard shortcuts to memory, I find the menu bar incredibly valuable. And while it’s almost always in the faces of every Mac user, it’s too often ignored. The menu bar, like the Utilities folder, is a place that make you a more efficient and informed Mac user. 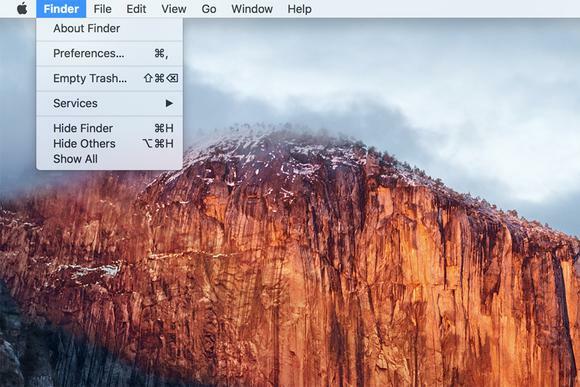 The Apple menu in OS X El Capitan. Another uniquely Mac touch that has been with us since 1984 is the Apple logo in the top left corner of the screen. Back in the classic Mac OS days, this was originally the home for tiny apps called Desk Accessories, and System 7 transformed it into a menu you could customize by dropping any item in the Apple Menu Items folder inside the System Folder. When OS X arrived, Apple almost eliminated the Apple menu in the OS X Public Beta, but ultimately shipped OS X 10.0 with more or less the same version of the Apple menu today. Today’s Apple menu is a repository for all the stuff that Apple wants to give you quick access to, but that isn’t specifically related to the frontmost application. 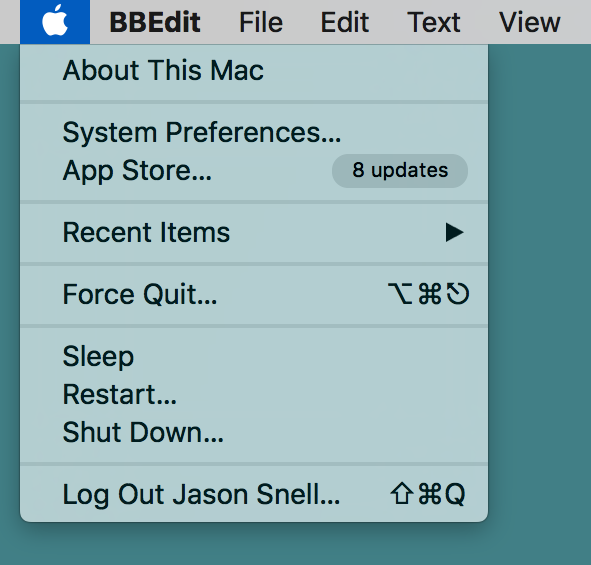 It gives you quick access to the System Preferences and App Store apps, a list of recently opened apps and documents in a submenu, and access to the Force Quit window. But perhaps most important is its integration of all the system power features which lived under the Special menu in the old days of Mac OS: Sleep, Restart, and Shut Down. As with so many things involving the menu bar, holding down the Option key will reveal a bunch of alternate options. If you want to restart or shut down without being asked if you’re sure, hold down the Option key while selecting those items. If you’re trying to launch the System Information app without seeing the About This Mac window, the same method will get you there. Next to the Apple menu is the Application menu, though it’s not labeled as such—this is the menu that displays the name of whatever the frontmost application is. Most of the menu items here are controlled by the application itself, but there are a few interesting window-management tools here, allowing you to hide the current app, hide all apps except the current app, or show everything that was previously hidden. More notable is that this is where the Services submenu lives. If you create scripts using Apple’s included Automator utility, this is where they appear. The Services menu is divided in two: Workflows that are available anywhere, anytime, and workflows that are particular to the app you’re currently using. The Help menu has a search function that can be used to find a particular command. At the far end of an application’s menus is the Help menu, and if you fancy yourself a power user, you may have never used this menu. The Help menu is usually a place to view documentation, open web resources, or report a bug. But I use the help menu all the time, because of the powerful search function built into it. From the top of the Help menu, you can search the contents of every menu of the currently open app. When I’m using a complicated app like Numbers or BBEdit or Logic Pro, sometimes I can’t remember where to find a particular command. And I don’t need to know: I just type a word from the menu item and move my mouse over the right result. That menu item will activate and a big arrow will point right at it. You know, for education. You can also just click on the result to activate that command as if you had known where it was all along. At the far right of the screen are a collection of icons supplied by Apple that give you quick access to information and other features of your Mac. 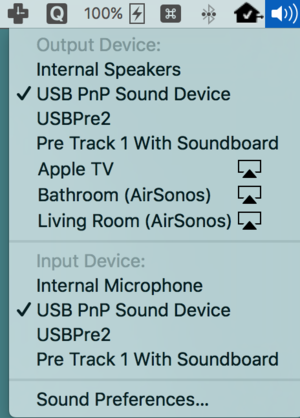 Exactly which items you see will depend on what kind of Mac you’re using (if it’s a laptop, you’ll see the battery menu-bar item) and how it’s configured. 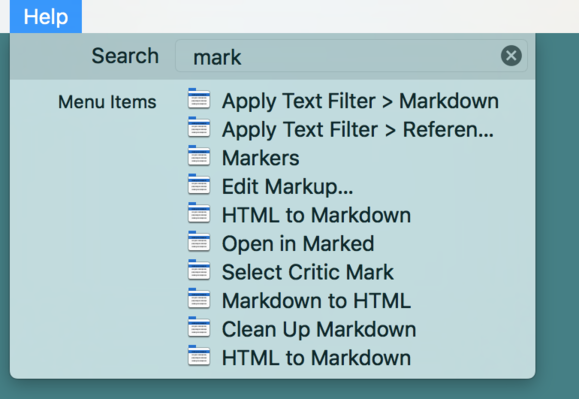 It’s obvious how to use these menu bar items—you either look at them to garner information (like how much battery you have left, or what time it is) or you click on them to reveal a menu with more information or commands. But if you hold down the Option key before you click on a menu-bar icon, you may discover that some seemingly simplistic items have unexpected depths. Sound options from the menu bar. If you’ve installed apps beyond what Apple provides, you may discover that some of them add icons to the menu bar as well. Dropbox lives in my menu bar and provides feedback when it’s syncing files, and I can click on it to quickly see what’s been added to my Dropbox recently. Online backup tools generally put a status item in the menu bar, providing quick access to your backup tools. Fantastical 2, which lets me glance at my forthcoming schedule and quickly create new calendar events simply by typing. TripMode, a utility that lets me control what apps get to send data over my network connection. I use this on my MacBook Air when I’m tethering to my iPhone, so it doesn’t destroy my data allowance with stuff like online backup, and on my iMac as a way to ensure that only certain apps are using data when I’m doing a podcast or video conference. BitBar, a free app that lets you put just about anything you want into the menu bar. I use it to display the current temperature from my backyard weather station, but you can script it to do just about anything, or just download one of the many pre-built plug-ins for it. Finally, I have to heartily endorse the $15 utility Bartender, which gives you unprecedented control over your menu bar. 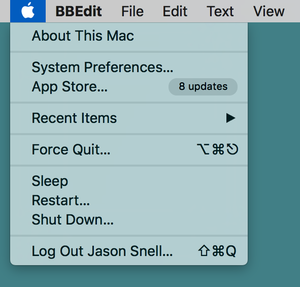 Bartender lets you hide menu bar items, show others, and relegate others (even Spotlight and Notification Center!) to a sub-menu, allowing you to de-clutter the menu bar. I love the control that Bartender gives me over my menu bar. Just as the menu bar is one of the defining features of the Mac, so is personalization. There are many menu bars out there, but this one is mine.